The New Zealand economy grew 0.6 percent q/q in the fourth quarter of last year, in line with market expectations. This saw annual growth slow from 2.6 percent in Q3 to 2.3 percent in Q4 (annual average growth eased from a revised 3.1 percent in Q3 to 2.8 percent in Q4). 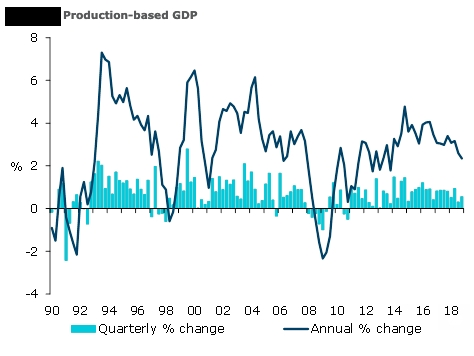 However, today’s print was below the RBNZ’s February MPS forecast for growth of 0.8 percent q/q, pushing their outlook for an acceleration in annual growth to 3.1% this year a little further into ‘optimistic’ territory. Turning to the details of today’s release, solid 0.9 percent growth in services industries was the clear standout, with broad-based strength across the components. Both retail trade & transport and postal & warehousing surprised us on the upside, suggesting robust household demand. Q4’s solid rise was on the back of soft services growth in Q3 (just 0.5 percent), suggesting there was an element of timing in last quarter’s weakness. Growth across goods-producing industries was on the weaker side, at 0.2 percent q/q. Construction came in a little softer than expected, up 1.8 percent. Primary industries GDP contracted 0.8 percent, with both mining (-1.7 percent) and agriculture, forestry and fishing (-0.6 percent) soft. Per capita growth of just 0.1 percent q/q was weak, particularly in the context of downward revisions to Q3 growth (from 0.0 percent to -0.1 percent). This saw New Zealand narrowly dodge a per capita technical recession such as has been seen in Australia. Annual growth in this measure continued to moderate and is now running at just 0.9 percent. Meanwhile, implied labour productivity growth looks underwhelming, with population growth remaining the key driver of headline GDP growth. Admittedly, per capita measures have become more uncertain since the implementation of outcomes-based migration data, ANZ Research reported.